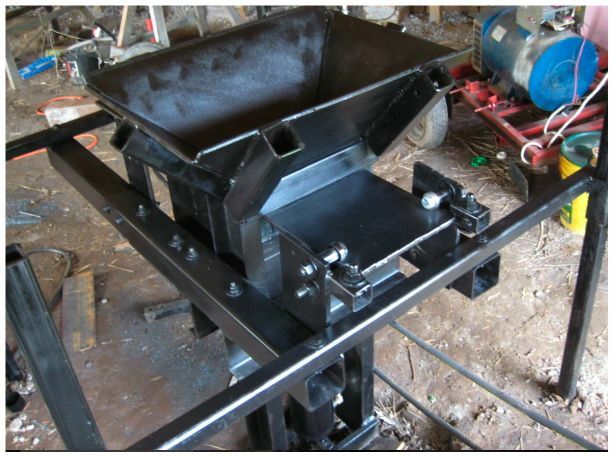 After 16 days of active build, the Compressed Earth Block (CEB) press prototype II is finished. You can compare this to Prototype I video in a previous post. We are well on our way to our first significant product release. CEB Prototype II Build from Open Source Ecology on Vimeo. Rail guides which allow frictionless motion of the loading assembly, and eliminate the possibility of the machine jamming due to misalignment. This addresses the major issue we had previously, where a replaceable nylon 6/6 friction liner broke after less than 5000 bricks were pressed. We had significant issues with liner attachment. In this version, the liner is eliminated all together, and is replaced by an air space. This is achieved with the bearings, which fix the loading assembly in two dimensions, and allow it to hover slightly above the table. Extendable hopper. 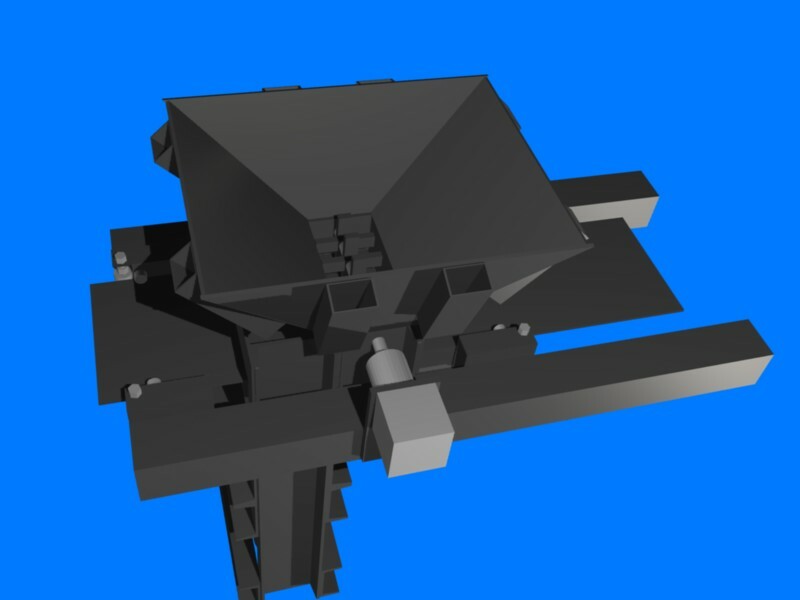 The hopper, as shown in the video, can be extended by inserting supports into the square tubes attached to the hopper. This way, the hopper can be expanded to 6 feet in size. This allows for loading of the CEB machine with a tractor front loader – the most important feature of Prototype II. Modified legs. First, the 4 retractable legs allow for balancing of the machine on uneven terrain. Second, the machine is designed with a small base area so that by digging a small hole of 10×12 inches in size, the frame can be lowered underground. This allows the machine to be placed at ground level, such that the machine can be loaded with a wheelbarrow. We have pressed our first signature brick with the new machine, and inscribed it with the name for the first donor for Inga’s House. Our next step will be field testing. The progress so far is promising, as we are finally optimizing our earth construction ability. We learned last year (CEB Story) that effective earth construction can happen when we can utilize tractor assist in all the earth handling operations prior to brick pressing. This stems from the basic fact of earth construction â€“ that earth handling is a laborious process. In designing an effective earth building operation, it is necessary to mechanize as much of the earth handling as possible. This is a major learning on our path towards creating a post-scarcity economy. one question… maybe it’s written somewhere here, sorry if it is. How are the hydraulic arms movements coordinated ? Is it automatic ? Are you guys planning to keep the brick size the same for both wall bricks and vault bricks? Most of the Nubian vaults use a thinner brick for the vaults, but I have seen it done with thicker as well. I think it depends on how well your bricks are made. We plan on using 6x12x4 inch bricks for the walls, and 6x12x3 inch bricks for the vault. It is easier to create the rounded vault shape when you use thinner bricks. Pawel, presentlly, the machine is being tested with manual control valves for the two hydrauilic cylinders. We will be adding automatic control after that, as part of the work leading to product release. For the vault, the I don’t see why 1 inch on the thickness will help you with curve. If you are doing a Nubian vault (no forms) they are curved on the 6 inch side, not the 4 inch side. And either way, they is no problem making the curve with either side. You should also consider inserts for the press to make different kinds of bricks, like a U brick for lintels, footing forms, bond beam forms, etc. Very easy to do, just make a wood block that fits into the press like you want. Also, half bricks are a good thing as well, maybe even some bricks with grooves for utilities. Does anyone know of any free or open source plans for a manual press? The Liberator is an awesome design, but here in the developing world, we need manual tools to make it happen, like the CINVA ram, or something similar. Any ideas? any other plans that you know of? What about the CINVA ram you mentioned? If you re making custom bricks for vaults why not make a wedge shape? That would make some sort of glue bond possible? How can I help volunteer. I would like to take an active role in assisting your team.